We asked some seasoned brewhounds to share the world's greatest brewery experiences—from sipping wild ales in the Oregon forest, to exploring Belgium's most storied sours. If you’re a committed beer nerd, you’ll be familiar with the drill: Touch down in a new town, throw your bags down and chug a plastic cup’s-worth of water at the hotel, then beeline for the nearest brewery, brewpub, or tasting room. It’s an exciting world for the beer tourist these days, with nearly every city in America—from Los Angeles to Charlotte, NC—sprouting upstart operations that churn out local interpretations of IPAs, stouts, and even spontaneously fermented sours. And those lucky enough to hop the pond have the opportunity to explore the storied Old World breweries of the continent, as well as burgeoning craft-brew scenes in cities like London, Rome, and Copenhagen. But not all brewery experiences are created equal. The vast majority are set in dingy industrial parks, where you can’t do much more than sip a three-ounce pour of the latest habanero-infused whatever while sitting on a sack of malted grains. 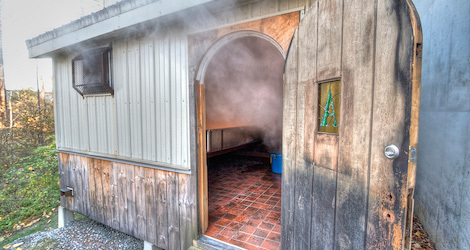 But whether you’re venturing through the cobwebs in the Cantillon barrel house, or inhaling the glorious aroma of the whole-flower hops room room at Deschutes, certain breweries can provide a near-religious experience. These are the places that are destinations in their own right, rather than sudsy stopovers to crow-bar into a broader itinerary. Read through their picks, then fire up Kayak and start plotting your next beer adventure. Italy? For beer? Veramente, signori. 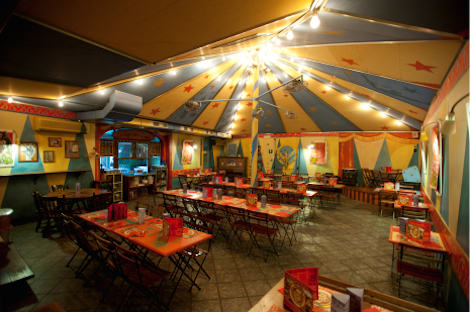 Everything changed in 1996 when Piedmont brewer Teo Musso turned Le Baladin, his cozy pub and circus tent-like beer garden in the central piazza of Piozzo (a truffles and Bararesco-producing area of Piedmont in the Lange region of northern Italy) into a game-changing brewpub. Using abundant spices and other unconventional ingredients in beers like Nora—a spicy brew made from ginger and myrrh—Musso’s operation seemed to be inspired by the films of Fellini (with Musso as le baladin, or “balladeer,” leading the tipsy, artistic parade). Three years later he was hosting beer-pairing dinners at Casa Baladin, his farm-to-table gastro pub and guesthouse across the square, with luminous white stone floors, exposed tree trunk beams, and three whimsical guestrooms. Now Musso’s parade has grown tenfold, with a bigger production brewery, stylish cafés in Rome (Open Baladin) and Essaouira, Morocco, and collaboration brewpubs with Eataly. 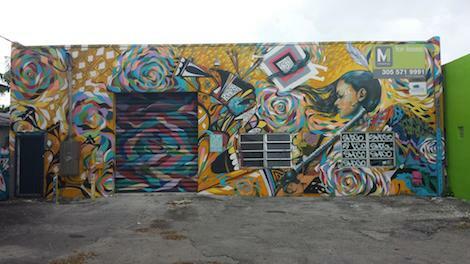 But the original is a must-visit for any diehard beer lover. The hundreds of Italian craft breweries that now exist are indebted to Baladin, the place that started it all. When I first visited in the fall of 2011, I happened into a jovial meeting of the national association of beer tasters, testifying one and all to just how far Musso—and artisanal beer—has come in Italia. Drive southeast of Columbus, OH, and the metropolitan sprawl will in time fade to the farmland of Lancaster, where the water’s mineral makeup is awfully similar to that of Belgium’s Wallonia. 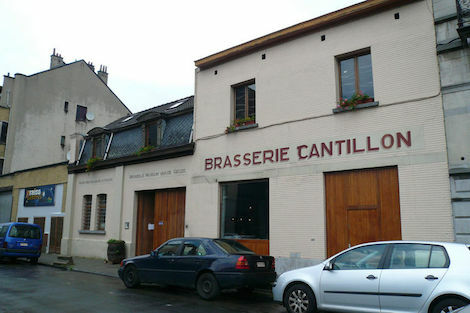 That region, if you require a refresher, is home base to Brasserie Dupont (a.k.a., the standard-bearer of saisons). It’s dry, prickly, flagship ale led to sommelier Matthew Barbee’s good-beer awakening. Upon relocating from Chicago to his family’s lush Lancaster farmstead, which once housed horses, Barbee had his water analyzed. Realizing his aquatic stroke of good luck, he transformed the land into Rockmill, spending several years perfecting his hand-corked, Belgian-inspired saisons, dubbels, and tripels—all of which are as nuanced as anything concocted across the pond. 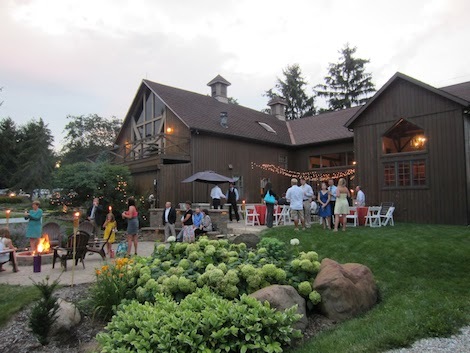 To fully appreciate his European-inspired ales, visit the brewery’s soaring, fireplace-equipped tasting room, which is housed on the property’s main barn. It’s impossible to find more authentic farmhouse beer in the Midwest. Bend has earned its rep as one of the country’s finest craft-beer havens, with more than a dozen excellent breweries (Crux Fermentation, Boneyard) all within a stone’s throw of downtown. But for a beer adventure unlike any other, you’ve got to drive west into the conifers of the Deschutes National Forest, where you’ll find a wooden garage/barn that’s home to Paul Arney’s eccentric sour-beer project. Arney mastered his craft over the course of 15 years at Deschutes Brewing, but Ale Apothecary is a far more personal and offbeat operation, with oak barrels named after departed family members, and shelves packed with heirlooms passed down from three generations of independent drug-store operators. The results of Arney’s efforts are beers with a distinct sense of place, borne of the mystical interaction between local raw ingredients, the microflora of the surrounding woods, and the brewer’s naturalistic, purposely primitive methods. There’s no better place to drink them then right where they’re made, in the beautiful Oregon wilderness. A beat-up warehouse across from a graffitied, vacant lot (seriously, check it out on Google Street View) isn’t the scene you expect when you arrive at one of the world’s most iconic breweries. But passing under the shingle featuring Cantillon’s iconic tippling man logo and entering this living, breathing Museum of the Gueuze is like stepping into another world. When I arrived with my wife on a frigid December morning, we were handed a pamphlet and encouraged to take a self-guided tour. 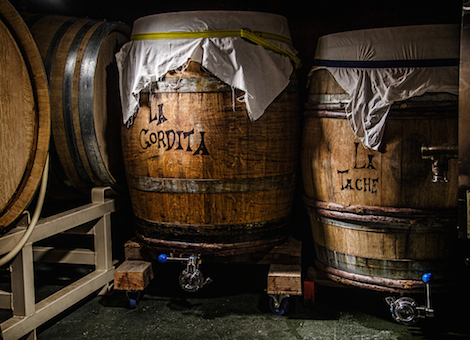 So we did, exploring creaky rooms full of old barrels and even older equipment—some out of commission, most still used, everything caked with dust and surely packed with micro-organisms crucial to the flavor profiles of Cantillon’s iconic beers. Afterward, we retired to a small tasting area and ordered a bottle of 50 Degrees North-4 Degrees East, Cantillon’s highly-limited, cognac-barreled gueuze. As we drank, a dear old man stoked a fireplace right in the middle of the room. This was Jean-Pierre Van Roy, the retired owner who took over the brewery from his father-in-law, Paul Cantillon, in 1969. The hunky Jean Van Roy, Jean-Pierre’s son and the current brewmaster, wandered the brewery doing actual brewery work, as American beer babe types flagged him down for selfies. We met some beer lovers from the Czech Republic and split a lambic basket of Lou Pepe Framboise with them. And we were so pleasantly drunk by the time noon hit that we dropped $100 on t-shirts and glassware and other merchandise before floating back to the real world. I think about returning nearly every single day. Head northwest from downtown Philly along what locals call the Main Line and you’ll eventually come upon a posh little hamlet called Ardmore. 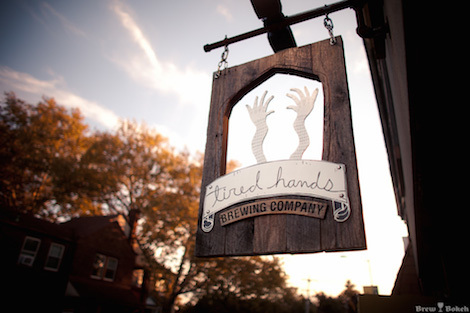 There, Tired Hands‘s Jean Broillet IV, a veteran of Weyerbacher and Iron Hill, pulls inspiration from pagan mysticism, 80’s thrash metal, and Eastern Pennsylvania farm culture to craft elegant and eccentric beers served only on premise. Broillet’s passions are numerous—farmhouse ales; big, floral IPAs and pale ales; offbeat German-style sours—and his DIY punk aesthetic permeates every inch of the rustic space, from his own hand-drawn art decorating the walls to the woodsy, cabin-occult tchotchkes strewn behind the upstairs bar. The result is one of the most cohesive, singular, and beautiful visions of what an American brewpub can be, with a pitch-perfect execution of beer and food to match. The most memorable breweries to visit are often the ones that bring the idea of terroir to beer. Despite being located on a back-country industrial complex off I-84, that’s exactly what O.E.C. is doing out in Connecticut. Few breweries offer such a compelling glimpse into entire process of beer-making: They’ve built an authentic copper coolship (an old-fashioned vessel used for making sour beers), they’re harvesting many raw ingredients themselves, and they’re cultivating unique yeasts from fruit grown on the property; it’s a mad scientist’s brewery fantasy. The whole place is run on a 19th century-style German brewing system, powered by an open flame (which is run, oddly enough, by computers!). It’s far-out, strange place, but OEC makes you realize the alchemy behind craft brewing—that special blend of farm life, science, art, and magic yeasts! 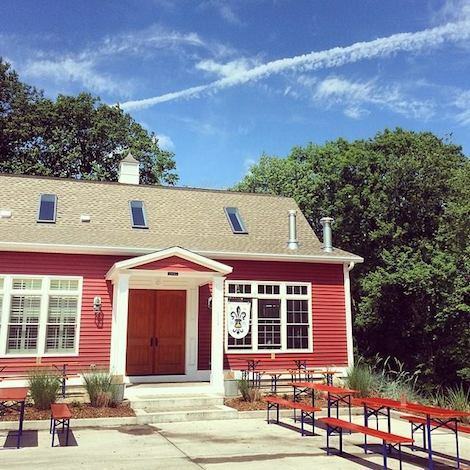 On a recent trip up to Portland, I harassed my family to play designated driver so I could drink my fill at Allagash, Maine’s premiere brewery that sits on a quiet street just outside the city, right off I-95. One of the things I loved so much about my visit there was being able to see the history of their mighty expansion. The first brewing system they used is still on hand, and the tour guides provide a wealth of information about its evolution into a larger brewhouse. What really makes Allagash a special place to visit is the barrel room, where you go to sample Allagash’s core beers. During the tasting session, you can wander through the rows of barrels, from huge oak vessels to tiny casks, all aging incredible beers; one detour lead me to a side room where I gazed in awe at the volume of barrel-aged beers. Make sure you hang out in the tasting room when the tour finishes. If the weather permits, you can sit on the patio and play bocce with your friends. For sheer power to inspire, for haunting beauty, for its oddity, and for its audacity—we pick Rodenbach. Google “Rodenbach” (Ferdinand, Alexander, Eugene, Georges, Albrecht) and you will discover the eminent place the family occupies in the history of medicine, statesmanship, literature, and brewing in Belgium. They have the brewery to match. The noble and imposing brick “beer campus” on Spanjestraat presides over Roeselare—a trading centre and port town in West Flanders. Across the street from the brewery complex, set back on a wooded garden property, is the late-19th century chateau built for the brewery director. Both on-site malt kilns and directors’ manor houses are common features of historic Belgian breweries, but this is an exceptionally good example, illustrating the status of brewers in Belgian society and the ties to agriculture. Among red beers (a subsegment of Flemish brown coined by Michael Jackson), Rodenbach is universally considered the quintessential example. It more resembles a distillery or winery than brewery, and the entire complex is a living museum of industrial archaeology. Considering the fact that the beers take upwards of two years to ripen and require a virtual forest of oak to produce, it’s unlikely than any such brewery will ever be built again (the watchword here is certainly not efficiency). Visitors see the gleaming new brewhouse and the vaguely nautical retired brewhouse (in service for nearly 150 years); tour the malt kilns; and receive an orientation on the history of the family. But impressive as these elements are, they pale in comparison to the cathedral of 294 oak foeders (giant vats), the oldest of which date to the mid-19th century. The foeders are more than 20-feet high and occupy a labyrinth of cellars, standing in huge, silent rows performing their magic, transforming a sturdy ale into the uniquely flavored ruby beer that is Rodenbach. No fewer than five (and some say as many as 20) yeast strains are at work in the enormous vats. Each foeder is it own microclimate. Blending these beers is essential to establishing a house character from one batch to another. The tuns range in size from 180 hectoliters, to 350, to the mighty 650 hectoliters. Eugene Rodenbach learned the art of acidifying beer through aging in wood from porter producers in England, with whom he studied in the 1870s. Classic Rodenbach is a blend of 25% aged beer and 75% young ale. 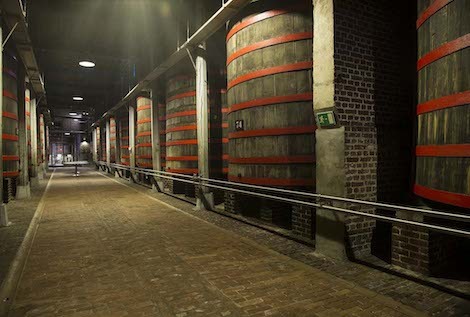 If you love sour beer, you owe it to yourself to visit Rodenbach. Make sure to book ahead. 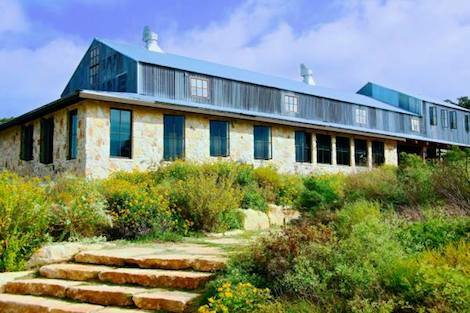 Located a half hour west of Austin proper in the Texas Hill Country (home of the BBQ epicenter, Lockhart), Jester King’s farmhouse brewing facilities exist on several acres of ridiculously gorgeous land. Near the brewery itself are maybe a dozen picnic tables, scattered beneath monstrous trees where you can drink Jester King’s innovative sours, huge stouts, and other offbeat ales. (Don’t expect any standard-issue IPAs.) Across the way, just beyond a couple Airstreams repurposed as restrooms, there’s Stanley’s, which serves amazing handcrafted pizza, along with a bunch of bottles from other breweries like Prairie, Firestone Walker, Ranger Creek, and Deschutes. When we visited, I told my wife that we were leaving the house behind. Someone could bring us the dogs. We’d live at Jester King now. She talked me out of it eventually, but the Airbnb across the ranch’s pasture is certainly tempting. 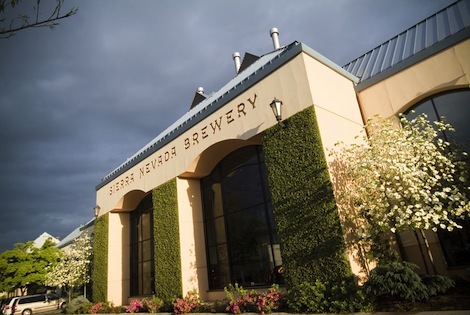 Located in the northern region of arguably the best state for craft beer in the U.S., Sierra Nevada delivers the total package: a rich history dating back to 1979, a high-tech sustainability program, a jaw-dropping packaging facility, an eight-acre hop farm, a kickass gift shop, and educational tastings—plus, the option to choose from a variety of themed tours including the Sustainability Tour, Brewhouse Tour, Beer Geek Tour, and Self-Guided Tour. And if you’re hungry, the 19-draft Taproom and Restaurant is top-notch. What else could you want? How about a second 350,000-square-foot brewery that promises to be just as gangster, set on 190 acres in Mills River, NC. It won’t have its own hop farm though, so a pilgrimage to Chico is more or less mandatory. My two bucket list breweries are at opposite ends of the spectrum, both geographically and visually. The first is Monhegan Brewing, located on Monhegan Island, about 10 miles off the coast of Maine. You can’t drive to Monhegan—you can only get there by boat, which was how all their brewing tanks arrived. 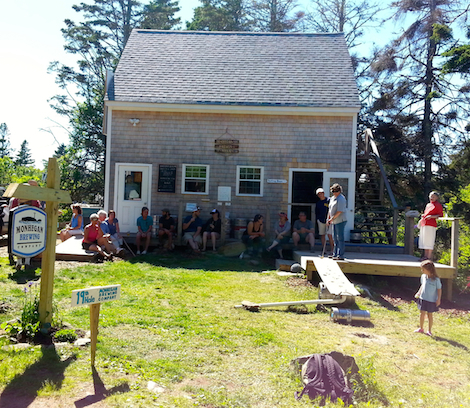 Imagine building a seven-barrel brewery on the backside of an island with 60 year-round residents. All of their ingredients, and most of their customers, arrive by sea during the warmer months (Monhegan is only open from May through October, for obvious reasons). The brewer is Danny McGovern, who’s been brewing at various Maine locations for 20 years. For this venture, he partnered up with his daughter and son-in-law. Danny is known for his IPAs and big stouts, which taste pretty good with a fresh island breeze.